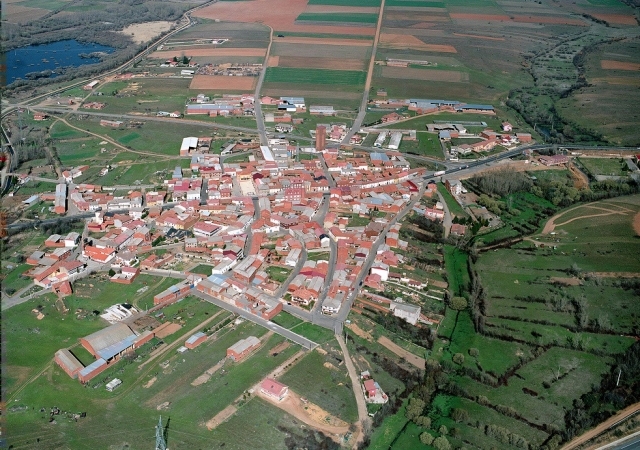 A problematic exit from León leads to Virgin del Camino, the point at which the pilgrim must choose between a path that runs parallel to the main road and passes through a few villages with services or a route which runs through the tranquil countryside. The first leads to San Martín del Camino and is the historic route. The second goes to Villar de Matarife, a place that retains with insistence the passing of the Camino through its streets. The two routes do not meet until the Hospital de Órbigo, on the second stage. Of course, as with other days the guide aims to orientate the pilgrim, but those who find the strength to continue can continue walking and stay overnight in the Hospital de Órbigo. The exit from León is full of traffic and noise. After crossing the bridge over the river Bernesga, situated just outside the parador San Marcos, the pilgrim faces a string of uncomfortable avenues full of junctions, traffic lights and unfortunately less pedestrian crossings that desired. The recommendation is to walk on the left hand pavement, as it is here that they will find the yellow arrows, painted on lampposts and posts, accompanied by scallop shells and vertical signs on the road. Head straight until reaching a walkway, which crosses the railway line and leads the pilgrim to Trobajo del Camino, although picturesque, it is full of traffic and shops. One of the few footprints, which does justice to its Jacobean name, is the small chapel of Santiago Apostle that has firmly resisted all possible renovations and has maintained its historic origins. Continuing on the left side, a vertical sign on the door of the florists of Maria Angeles orders the pilgrim to deviate to the left and later right to begin a small climb until reaching the N-120. After pushing the button at the pedestrian crossing, the pilgrim should cross over to arrive at a path which will lead them to an industrial area with warehouses and empty plots below electric power lines. After a few meters parallel to the N-120 on a service road with an industrial bakery the walker will soon come to a petrol station. This is a dangerous area given that the pilgrims have to step foot on the hard shoulder of this busy main road. The previously mentioned petrol station offers a terrace with shade, but a few meters ahead and now in Virgin del Camino, pilgrims will find an extensive range of services. This place is perfect for the first stop of the day, take the opportunity to drink plenty of fluids and have breakfast, (it is surprising how many bakery shops you can find in so few square meters). Also, for those unsure there is a choice between two possible deviations, these will be presented shortly. On reaching the church they have to cross to the left side of the road and go down Calle de la Paz, leaving behind the fountain of Cañin. At this stage the yellow paint on the road is excessive. From Villar de Mazarife and San Martín del Camino, the two local rivals, both of which seek the attention of the pilgrims and consequently send workmen on a regular basis to haphazardly paint the road yellow. The most historic route reaches San Martín and runs almost entirely along a path, full of services, parallel to the N-120. This route leads to Villar de Mazarife, a place that proudly claims the passing of the Camino on its terrain, arguing that it is the route of the old ancient road and the patronage of the Apostle. Along this route there are hardly any services until reaching the end of the stage. It is more tranquil and runs mainly through the moor. (For this option, turn left onto a dirt track). The exaggerated amount of paint on the road becomes very confusing, to the point that at times the walker feels like a racer on the Tour De France. Whatever the choice of route, further ahead there are, on a number of occasions, the option to rectify your decision and join the other route. (There are plenty of signs that indicate how). 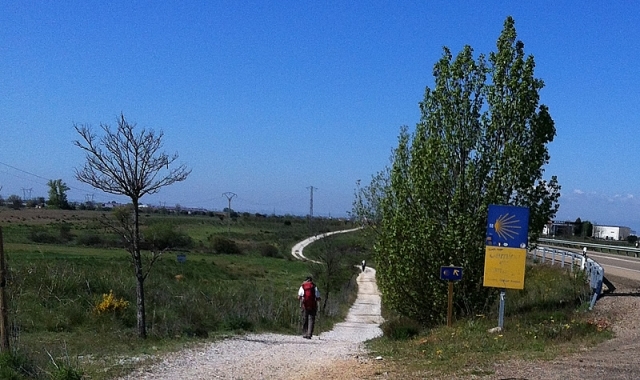 On route to San Martín del Camino and after an uncomfortable stretch due to uneven ground, they reach a roundabout from which they can access the path. A brief walk along a gravel track leads to a dark underground tunnel that passes under the main road. At the end of the tunnel a yellow arrow painted on the trunk of a tree indicates the walker to turn right and continue up a gravel track until reaching a small industrial estate. A few meters ahead they encounter another track, parallel to the N-120 that continues to Valverde de la Virgin. This small place has a few restaurants (Mesón el Yugo and Bodega la Borada), a small supermarket, a fountain and a cash machine. The bell tower of the church stands out, in which they will find four stalk nests. Without abandoning the path the walkers continue, taller pilgrims should duck to avoid hitting their heads on a misplaced sign in the middle of the Jacobean route. The next location, San Miguel del Camino, is very near. Here they will find a bakery, Mesón el Yantar del Peregrino (with a terrace, here service is available from breakfast until dinner). On the right side of the road hikers will pass the restaurant La Parilla and a bar/restaurant El Mesón de Julia. Agapito, a local from San Miguel del Camino, offers pilgrims a snack from a wicker basket, which he hangs from one of the windows of his house. In this area it is also possible to have the credential stamped, there is a sign indicating where, situated on a fountain 200 meters ahead. On leaving the village, after a short time walking at the side of the road, you cross a roundabout and return to the same route for a little over 6 kilometres. This stretch continues parallel to the N-120, although the ground alternates between earth and gravel. Half way along, a petrol station on the other side of the road is the only place to recuperate energy before reaching Villadangos del Páramo. The pilgrim can take faith in the fact that the name of this enclave does justice to its terrain: flat, without vegetation and thus barren. Before entering this place, a picnic area offers a few benches to pilgrims so they can rest from their journey. Pass through the village and deviate to the right to walk a few meters on a dirt track below the cover of trees through this wooded area. The pilgrims can quench their first at the fountain of pilgrims before returning to the path, initially on earthy terrain which, later turns into gravel track. In less than two kilometres the hiker reaches San Martín del Camino, the end of the stage for many pilgrims. The exit from León poses some difficulties for cyclists. The majority of signs for the Camino of Santiago are situated on the left side, well considered for those travelling on the pavement. However cyclists should take into consideration that these streets are busy from early in the day and thus can result uncomfortable. It is therefore recommendable that cyclists travel on the right hand side until reaching a florist shop, not easy to miss on the route. The rest of the stage can be completed along the right hand pavement, although the hard shoulder does not pose problems either. Just before reaching San Miguel del Camino there is a very narrow stretch with a security railing, which occupies the route for 10 meters. It is possible to continue or cross the road, all options are dangerous.